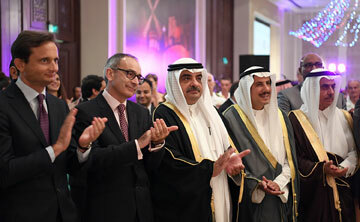 (Manama) – His Royal Highness Prime Minister Prince Khalifa bin Salman Al Khalifa has deputised his Adviser, HH Shaikh Salman bin Khalifa Al Khalifa, to attend the ceremony hosted by the French Ambassador to Bahrain, Bernard Régnauld-Fabre marking his country’s National Day. Ministers, senior state officials, members of diplomatic corps accredited to Bahrain and guests also attended the reception. HH Shaikh Salman bin Khalifa conveyed greetings from HRH the Prime Minister to the French leadership and people on the national occasion, as well as his wishes of further progress and prosperity to France and its friendly people. HRH Premier’s Adviser affirmed the depth of the Bahraini-French relations of friendship and cooperation in various fields, highlighting the two countries’ keenness on bolstering cooperation between them. The French envoy expressed sincere thanks and appreciation to HRH the Prime Minister for his interest in consolidating cooperation between the two friendly countries. Ambassador Bernard Régnauld-Fabre also stressed his country’s keenness on enhancing cooperation with Bahrain in various fields to meet the aspirations of the two countries and their peoples.